My kids are so excited for General Conference that their enthusiasm is like electricity in the air. They LOVE General Conference and it ranks as a "holiday", right up there with Halloween and Christmas (except even better because it happens TWICE a year). They have been saying cute things all day like, "When we wake up in the morning it is going to be General Conference!" followed by whooping all around. Or "I can't wait to go to sleep because it means it will be General Conference!" It is down right adorable. I give ALL credit for their love of General Conference to my mother-in-law. When we lived in Utah we would always watch Conference with them and, from the time they were little, she started having them play "General Conference Bingo", but with awesome prizes. Not only would they get candy to mark their squares with, but she would also have four or five brown paper bags for each child with surprises inside. When they got a Bingo they could open one of the bags. Evidently, they really love it. She also started the tradition of having the kids go run around outside whenever the choir started to sing, which they also love. It is cute to see them bolt out the door at the first sound of the organ. I think listening the the choir sing, while watching them run around the yard, might be my favorite part of conference. Though, since we are in perma-winter here (and it just snowed again last night) I don't know how much running around outside there will be this year! Speaking of General Conference. I LOVED the General Women's Meeting on Saturday. I had been a bit skeptical about how it was going to work having the Primary girls there, but I thought it was incredible. There was such a strong spirit of unity and love in our Relief Society that night. It really struck me hard how much women-- from age 8 to 88-- need each other. It was also neat to hear one of the speakers (forgot who) talk about how Satan is targeting girls younger and younger and how we need to teach them who they are at younger and younger ages. I thought that was a really powerful message, and it made me realize why our leaders had been inspired to include the Primary girls. These young girls are going to need lots of spiritual power and they need it young. They are incredible women in embryo, and it makes me really excited to see them grow up! They are going to be a great force for good in the world. On a sadder note, about three weeks ago my car started acting funny. It started to shake and lunge. When Jon opened up the hood to see what was wrong he discovered that some squirrels had built a nest inside our engine compartment! There was a huge nest with two (dead) baby squirrels in it. It was so weird, especially because I had been driving the car everyday. It is strange to think that I have been driving around town with a car full of baby squirrels! We noticed at the time we took the nest out that they had chewed several wires and figured that was the reason our car was acting strange. The day after we discovered the nest Jon had to go on a trip for a week, and since the car still worked, I drove it all that week. It was still acting funny but it was working, so I didn't complain. In fact, I gave the sister missionaries rides almost every day that week, and I told them that the only reason my car was working was because I was getting blessing for helping them. I said that jokingly, but when Jon got home he took a better look at the engine and couldn't believe what he saw. The squirrels had eaten through almost EVERY wire and connection in the engine; the battery wires, the harnesses, the spark plug wires, the compression hoses. Everything. There was NO way our car should have been working. I really must have been getting blessings for serving the missionaries! Jon fixed most of the wires and it was working for a day, but then it stopped working again for some mysterious reason. He has done just about everything he can think of to get it going again and nothing is working. It has been about two weeks that I have now been without a car, and it is getting old. Hopefully, we get it fixed soon or find a replacement we can afford. The kids, after I had a bit of a break down about it yesterday, told me that they think we should make the squirrels fix it. They are the ones who broke it after all! We had a lot of fun doing it, and she called later and told us that she had laughed and laughed about it. It was definitely worth the long walk! Asher has been really interested in video games lately. We don't have a gaming system but he loves to play Angry Birds and Bad Piggies on the iPad. He started asking me how to make video games, and I had NO idea. Luckily one of our home school friends has a 9 year-old son who is really into computer programming. They told us about a website called SCRATCH that teaches elementary school kids to program. It is a bit like building with Legos as it has blocks of computer code that you "click" in and arrange to create programs. You can download instructions for projects to make or you can buy the really great book that goes along with it. The book is a story that has projects you have to complete to help the main characters accomplish their mission. It is a bit advanced for Asher (he can't read most of it yet) but we have been doing it together and he has loved it. It is also really fun because I am learning how to computer program. Which is awesome, because to me computers might as well be magical creatures from Oz. It has been neat to see how it all works! 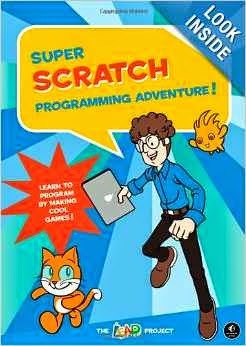 In fact, as I have been doing SCRATCH with Asher I have realized how important it is going to be for him, and all my kids, to be fluent in "computer language." They are growing up in a world that is just getting more and more digital and I want them to be empowered to create with computers, instead of just having technology be something that happens to them. When they understand how the computer works and can manipulate it and create with it then video games change from a passive activity to an active one. They are acting on the technology rather than being "acted upon" by it. I think that is going to be a very important difference in the world that our kids are growing up in. They are suppose to have a SCRATCH iPad app in the next few months for pre-readers, and I am really excited about that. This is something I look forward to learning along with my kids. 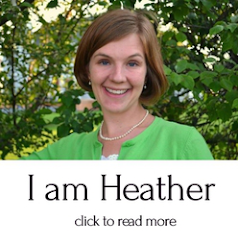 Also, this is an awesome TED talk about Scratch and teaching elementary schools kids to code. And last but not least... an update on my book! I am SO close to being done that it hurts... literally. I feel like I am in "transition" phase of birthing this baby. I currently feel like I am never ever going to be able to finish it, like it was the stupidest idea in the whole universe to undertake it, that no one even cares about women in the scriptures, and it is going to be a royal flop. None of that is true, but that is what my oh -so- positive self talk has been saying lately. Luckily Jon keeps me grounded and laboring onward. 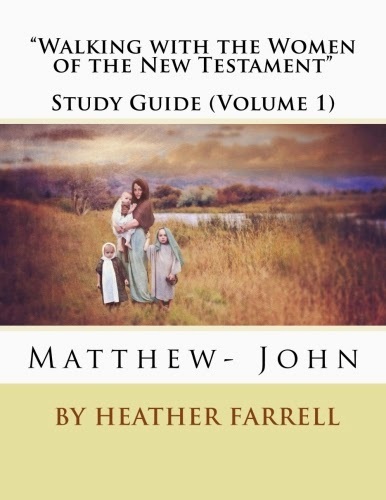 Today or tomorrow I should finish my last woman (did you know there are 85 women in the New Testament!) and then I just have my Introduction pieces to write and the appendix to organize. Also, there should be a cover very soon! I'll give you a peek as soon as I see it. The photography is turning out so beautiful! I can do it! I just have to keep reminding myself that this baby is worth it... right? Have a wonderful weekend and enjoy General Conference! we laughed and laughed about those googly eyes. oh man. and the baby (NT women book) is worth it. I'd buy it. and maybe use it as Christmas gifts for the other women in my life. What a cute idea with the fridge eyes!! You are so cute. 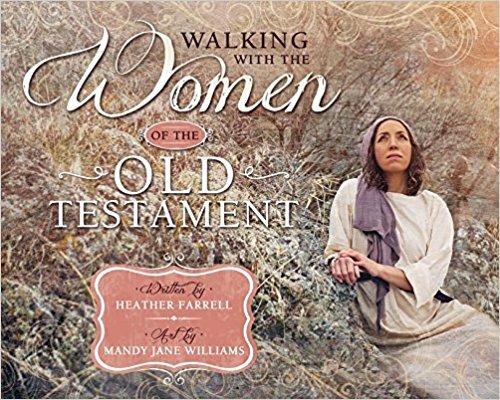 I really can't wait to read your book--I LOVE all the stories you put together about women in the scriptures. Also, thank you so much for putting up the kid computer programming thing. I always end up using the ideas you put on here. I'm a big copy-cat of yours. But my son will really love this, so thank you so much for sharing your ideas and things that work for you guys. We homeschool too, so it's always nice to hear what other people are doing. And I totally hear you on the eternal winter--I live in Alaska! haha. We are getting a lot more sunlight and are just dying to get to summer time. It seems like it will never come. Anyway, this has been plenty long, but thanks for your blog. It always inspires me!! 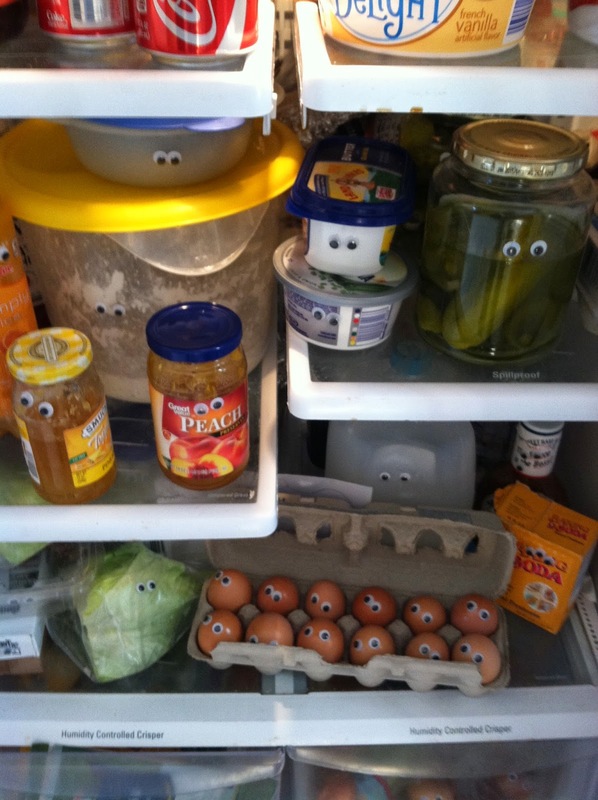 Fun fridge eyes! I am one who is a nervous long lost Auntie, awaiting the arrival of the new book! 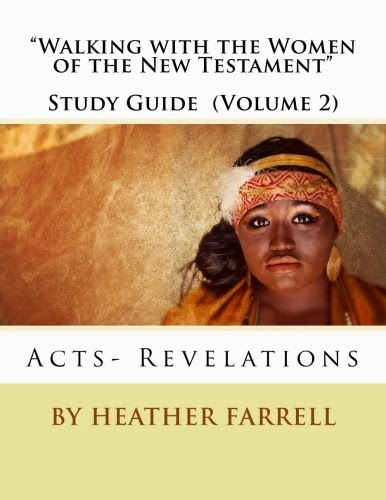 You have helped me not only love the women in the scriptures, but to study them and share them all as often as possible! It's kind of sad how few people take the time to see them and what they teach us. Thank you for ALL of your efforts to bring them each to our attention!! I loved the General women's meeting too. Great spirit there. Best of luck with the transition phase! Don't puke over everything. :) I will read your book, though that may not be much comfort. I wish we were next door neighbors! I was super excited when I heard about your book! 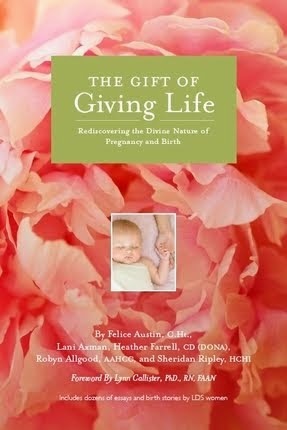 I am totally planning on reading it and I'm sure countless women will be blessed because of it. Can't wait! You are so inspiring! Can't wait to read the book! Hang in there with the book, you are so close. I can't wait to see the cover! 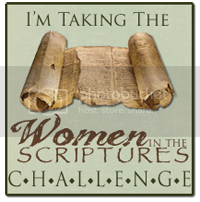 I am soooooooooooo happy to hear you are writing a book on women in the scriptures! I just hopped over to your blog just now because I'm preparing a lesson on Rebekah for my Valiant 9 girls and I just need some more insight on her. I found myself really wishing you had a book so I could just grab it from the shelf and look her up. Not that searching your blog will be that difficult, but I just loving have a book in my hand. YAY! 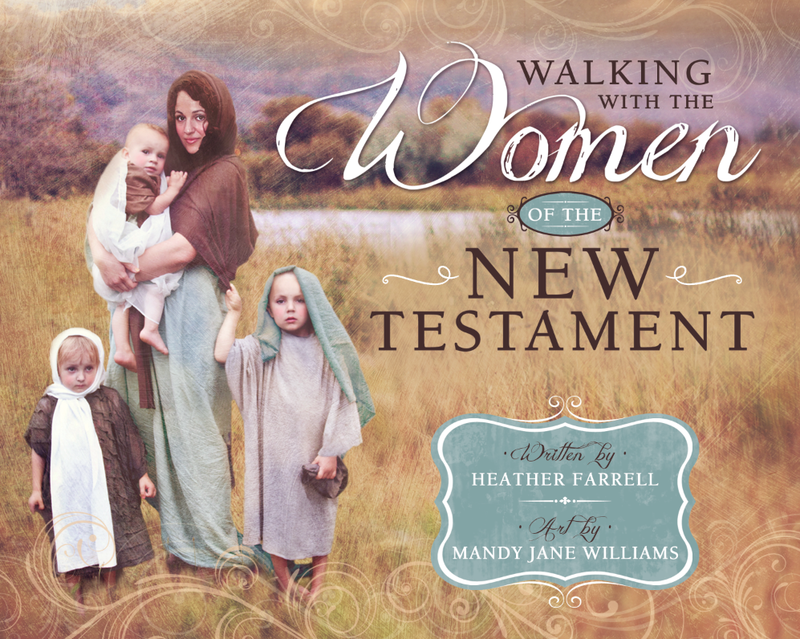 85 women in the NT??! I did not know that. Keep on keeping on, and I can't wait to buy it.